Since snapping up the Awak Mas Gold Project in 2017, ASX junior Nusantara Resources (ASX:NUS) has wasted little time in firming up its assets. The Awak Mas Gold Project, which sits in Indonesia’s South Sulawesi region, is one of just a few undeveloped gold projects within the Asia-Pacific region. The project, which has all approvals in place for development, has a 1.1 million ounce Ore Reserve and a 2 million ounce Mineral Resource. In late December, NUS released high-grade results from near mine exploration. These clearly demonstrate the Awak Mas deposit is the at centre of a goldfield that hosts a number of significant mineralised zones. Most recent results have included wide zones of 28 metres at 1.2 grams per tonne gold and 37 metres at 2.3 grams per tonne gold, as well as a narrower high-grade width of 11 metres at 2.6 grams per tonne gold. 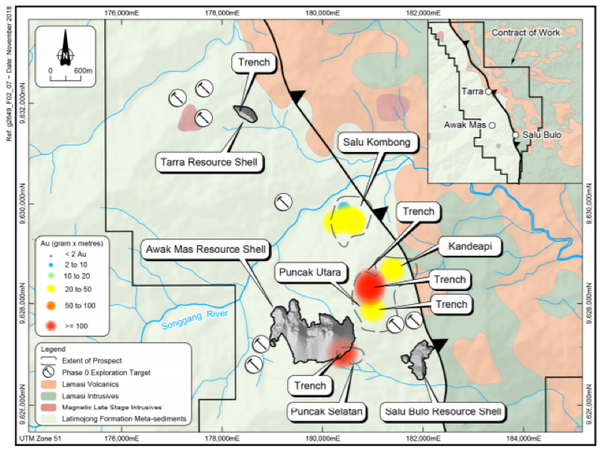 These results come from the Puncak Selatan, Puncak Utara and Tarra prospects, which form part of the broader Awak Mas project, highlighting the mineralisation potential of these areas. Current exploration areas, showing trench locations against near mine prospects identified as gram x metre anomalies. Backed by a bullish gold outlook, these latest exploration results continue to demonstrate the potential of the Awak Mas Gold Project to grow organically and provide potentially high-grade satellite operations to augment production from the existing deposits. 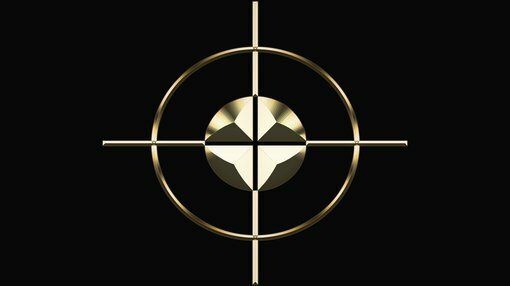 The exploration program will now be guided by significant new information provided through the re-processing of historic geophysical data which clearly demonstrates the potential for further discoveries across the entire contract of work area. To date, over 1000 metres of near mine trenching has been completed, which has yielded significant results. The current exploration focus is to follow up on historical exploration of numerous near mine prospects within a 2 kilometre radius of the planned processing plant, with the aim to extend the proposed 11-year mining operation. A positive Definitive Feasibility Study (DFS) completed in October — which coincided with an 11% increase in ore reserves and the identification of significant near mine mineralisation — suggests that the project is economically robust. The DFS supports an initial 11-year project producing approximately 100,000 ounces per annum at relatively low all in sustaining costs of US$758 per ounce. Based on current gold price, this means that the project is generating margins of around US$650/ounce. The project is supported by extensive infrastructure, with access to low cost grid power, port facilities 45 kilometres from the project, and multiple daily flights from the city of Makassar. The island of Sulawesi itself has a long history of mining and provides ready access to experienced contractors, services and work force for the construction and operation of the mine. Location of the Awak Mas Project.